I sent you a postcard from Scheveningen before. 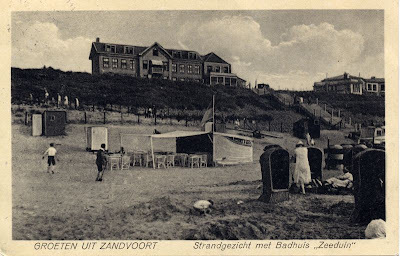 Today you receive a card from Zandvoort, another famous beach resort. Scheveningen was the beach resort of society, Zandvoort of the people. This card is more recent than the 1909 Scheveningen card (it was sent in 1927). The beach fashion had changed between 1909 and 1927, but there were also big differences in fashion between the two resorts. The buildings on this card are long gone: All landmark buildings were demolished in the second world war to hamper a potential invasion of allied forces.